This month in Dear Readers, I'm going to talk about a videogame system you've never heard of before. I was originally hoping to become the number one source on Google for information about this system—thus raking in oodles of new hits from people trying to figure out what this chunk of plastic they found at a yard sale actually is—but, apparently I was beaten to that eight years ago by Robert Morgan, who wrote a whole FAQ for the system. This month in Dear Readers, I’m going to talk about a videogame system you’ve never heard of before.1 I was originally hoping to become the number one source on Google for information about this system—thus raking in oodles of new hits from people trying to figure out what this chunk of plastic they found at a yard sale actually is—but, apparently I was beaten to that eight years ago by Robert Morgan, who wrote a whole FAQ for the system. Still, I’m not one to let relevance or timeliness deter me from writing about anything. And I’ve got one thing over Robert Morgan and his fancy-pants FAQ: He may have done it first, and in more detail, and on a better-known site…but I’m doing it with pretty pictures and videos. 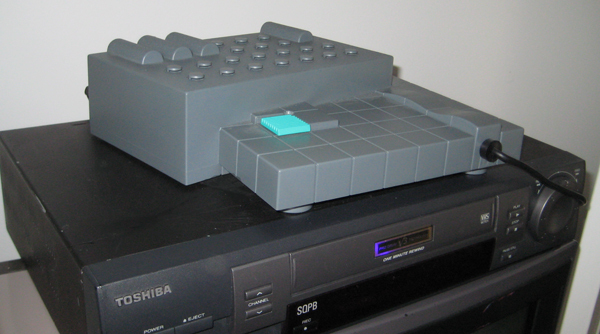 Apparently born via the unholy union of of Lego and…I don’t know, graph paper?…this ridiculous-looking videogame system was created by View-Master3 and marketed as, if Robert Morgan and his fancy-pants FAQ can be believed, a learning tool for children. 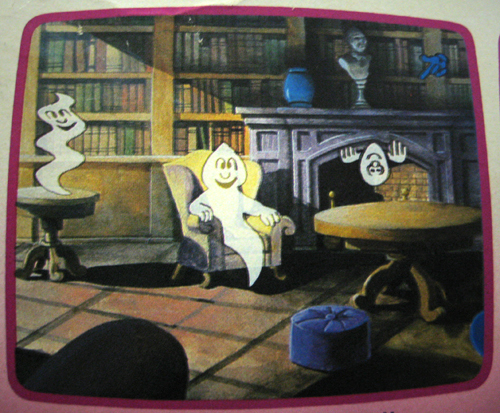 Its library corroborates that story, as all seven games for the system are based on either Sesame Street, Muppets, or Disney licenses. To you Doubting Thomases out there: Yes, this really is a videogame system. To you Believing Billys: There’s a reason Tom is doubting us, and that reason is this: There, very clearly, isn’t any slot to insert any games into this system. Right? Do you see one? The Internet hadn’t been invented yet, either, so the system doesn’t download titles, and I’ll just add right now that it doesn’t come preloaded with games, either. And you thought I was just being a bad photographer by including my VCR in that shot. 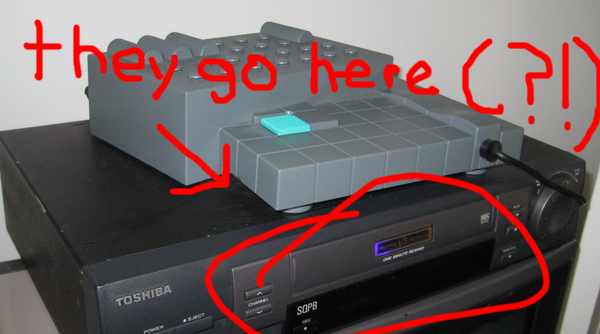 Yes, the IntVis4 actually connects to your VCR and runs on VHS tapes. Which, of course, doesn’t make any sense at all. So now the question is this: How can a system like that possibly work? 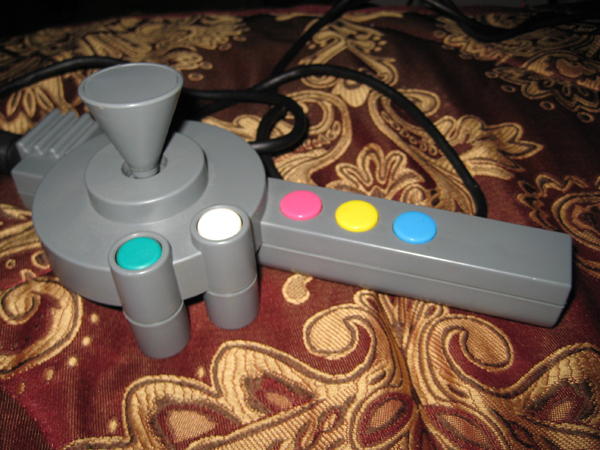 That’s the controller, and it’s as easy to handle as it is beautiful. It’s permanently tethered to the system, and, at least for the game I played—Disney’s Cartoon Arcade—of the five buttons it has, four are redundant. Every single button had the same function, so, to think in a glass-half-full kind of way, at least you have plenty of choices! Hey—some days you just feel like the blue button, and some days you just feel like the blue-green button. Actually, I don’t think the game could ever possibly look that good. All of the minigames in Cartoon Arcade play out more or less like this—some are Frogger ripoffs, some are puzzles where you have to rearrange the images to make a complete picture, and all could easily be done on an old Atari, without the cartoon backgrounds. As for other games for the system…we can probably assume that they play out similarly, but who knows! Actually, you could knows. I own four other games for this system, and, if you’re interested, I’d have no problem writing a full review of one of them. 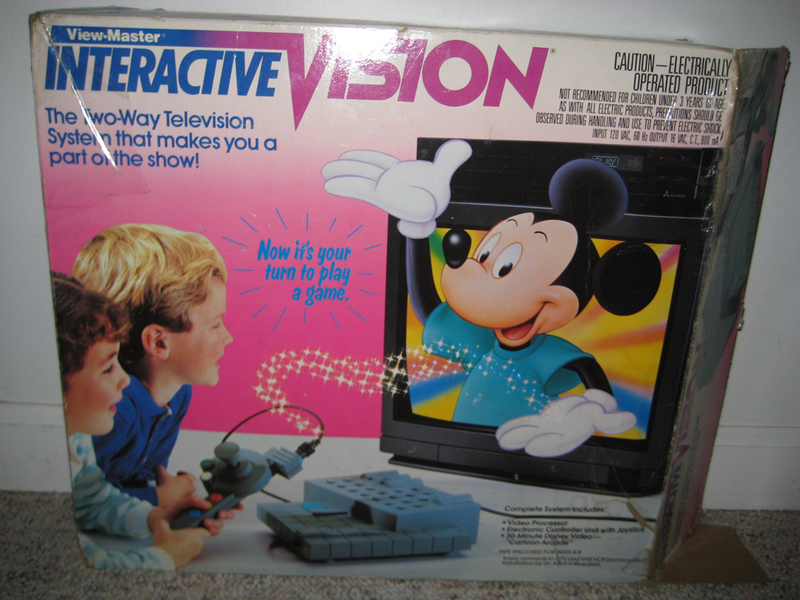 And that’s what I know about View-Master‘s Interactive Vision! For more, read the FAQ or post a comment asking nicely for a review. I’ve got plenty of other resources, too—if you want to see scans of the manual or game order form, more videos of the games, photos of the games themselves, or anything like that, let me know. I’m here to help. And I’m here to get your hits. One day, Robert Morgan…we will be ranked higher than you on Google. Not one! Not two! No, no wait, it actually IS two. Two guest reviews! One by a former GameCola staff writer and one by a mystery person from parts unknown. The Dog Whisperer! I have no idea what that is, but my local pet store sells t-shirts with his face on them, so he must be pretty interesting. Gender transformations and the early 90s! And commentary on the uncreativity of drawing penises in videogames. 2. Activity of the Month: Write a Wikipedia page for this system, citing GameCola! 4. I totally just made that nickname up. Pretty cool, right? 5. It can also alternate audio tracks, switching from the background tune of the tape to, for example, applause if you do well, but that’s not interesting enough to be more than a footnote. 7. This screenshot is actually taken from an image on the IntVis’s box. 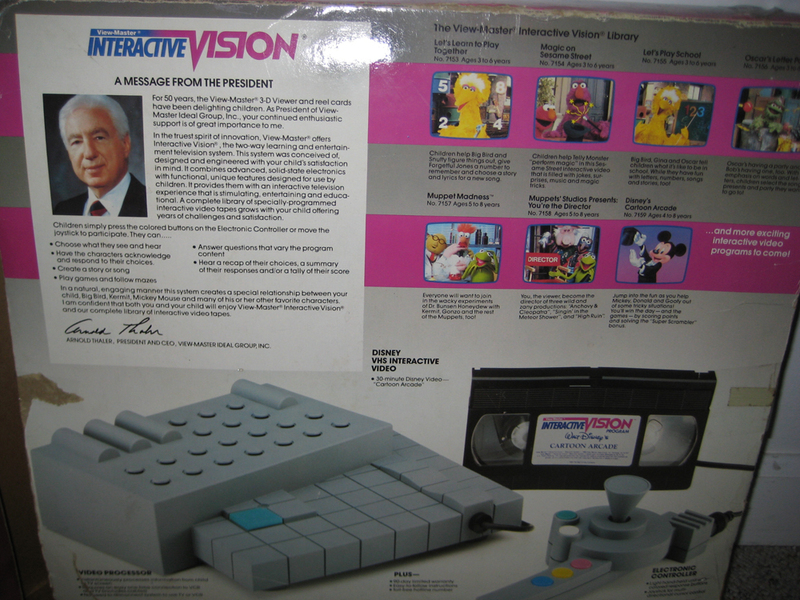 If you wanna see shots of the box—including a special message from the President of View-Master!—click here and here. So I can only say that if anyone has this game system with the VHS tapes I want it so I can make another little girl smile, laugh and happy!! Wow, another IntVis fan! If you want, I’d recommend checking eBay. That’s where I was able to find mine. They aren’t super cheap (I think I spent $30 or $40 on mine), but there aren’t that many other options, unfortunately.